Sharing adventures is the stuff friendships are made of. 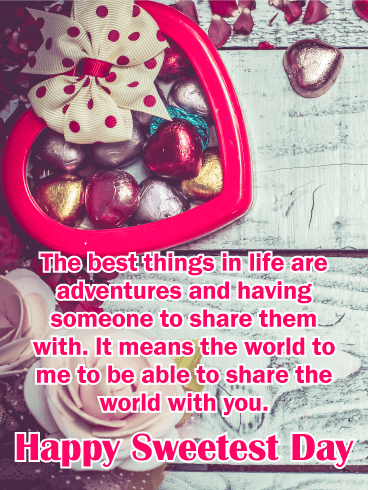 You adore sharing the world and your secrets with your friend, so tell your friend just how much that time together means to you with this Sweetest Day card. A cute box of chocolate candy topped with a polka dot bow on a background of white pallet wood and the palest pink roses carries your message to your friend. Friendship is one of the most enriching parts of life. 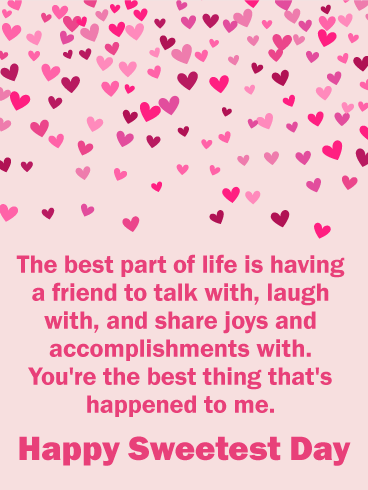 Sharing long talks, laughing into the night, and all of the joy and blessings life brings are what makes friendships last. Tell your friend how much you value what they bring to your life with this Sweetest Day card. 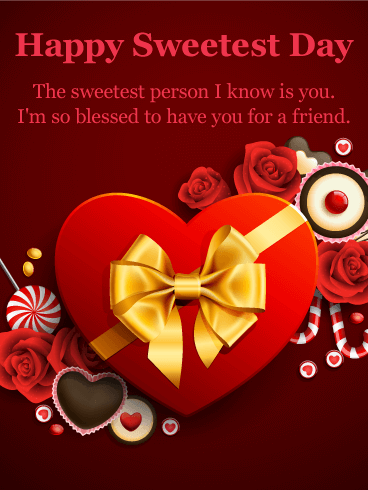 Hundreds of hearts in all shades of pink and red float down toward your message of Sweetest Day friendship on an apricot background. You love your friends, there's no doubt about that. 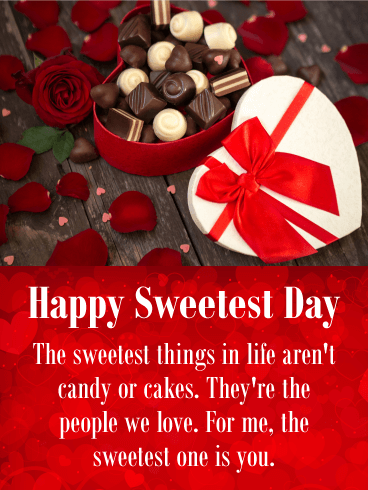 Make sure they know how sweet you think they are and just how blessed you feel to have them in your life on this Sweetest Day. A stunning array of treats surrounded by roses with a chocolate box for a centerpiece are the sweet setting for this Sweetest Day card to send to any friend. He's your honey, your love, your husband, and he makes your life sweeter each day. Tell your husband how much you love being married to him with this Sweetest Day card. Your message to your husband is superimposed over an adorable mint mug holding two heart-shaped lollipops, perfect for a Sweetest Day message reminding him that you love sharing your life with him. He's the one person who makes life worth living each and every day. If you were given the choice, you’d marry him again in a heartbeat. 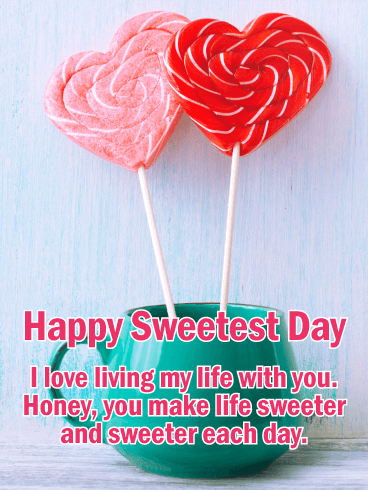 Tell your husband exactly how you feel on Sweetest Day with this Sweetest Day card. A pair of soft red heart-shaped balloons float through the sky in the background behind your message to your husband. 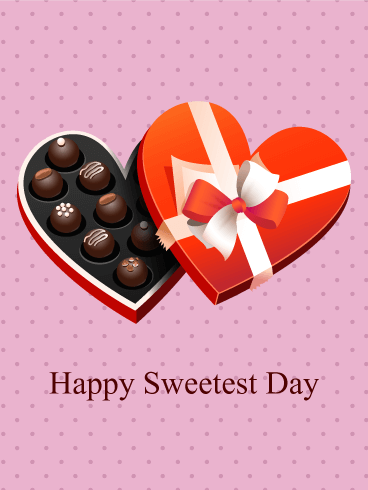 Tell someone important in your life that you love them on Sweetest Day. 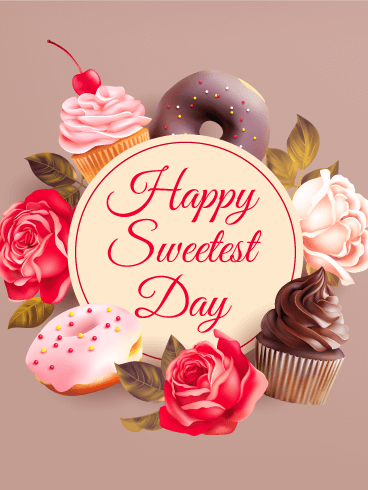 This card is perfect for the holiday about love and kindness with its simple message and pictures of roses, cupcakes, and donuts on a beige background. Lift someone's spirits or just let someone know they're in your thoughts on this Sweetest Day in a simple way with this Sweetest Day card. If you are in a relationship with the best person you've ever met, let them know how much you love them with this Sweetest Day card! The golden swirls make this a classy gift, while the bright red hearts show your affection and adoration. 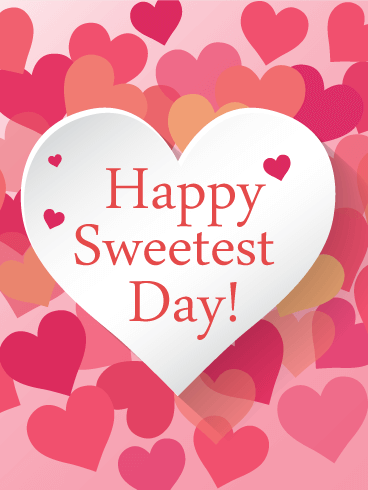 Shower your partner with the "sweetest" card you can find and make this an amazing day and celebration! Is your love sweet as candy and cute as a button? Let them know by sending this Sweetest Day card! The pink colors, hearts, roses, and fancy font will show just how much you adore them and how special they are to you. 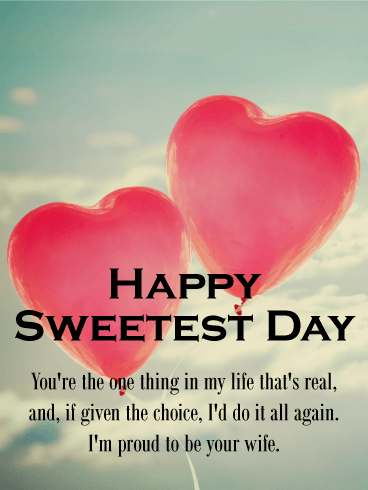 Make your sweetheart feel extra special and loved this Sweetest Day by sending them this touching Sweetest Day card today! Do you ever need a reason to buy your sweetheart chocolates and tell them how much you love them? Today, shower your love with gifts and affection by sending them this Sweetest Day card! The heart-shaped box of chocolates will show your adoration and create a romantic mood for the rest of the day's celebrations. Send this Sweetest Day card today! Has someone captured your heart and created a special place for themselves in your life? 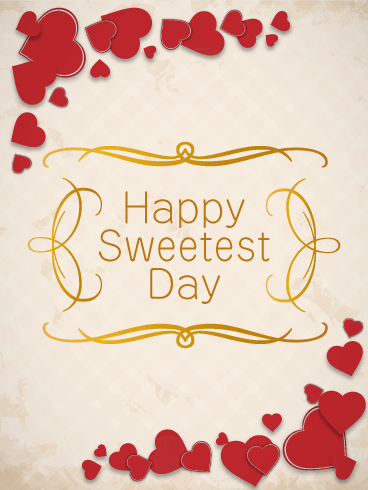 Celebrate your love and relationship by sending them this beautiful Sweetest Day card! Make this a year you will both always remember and tell your sweetheart how much they mean to you. 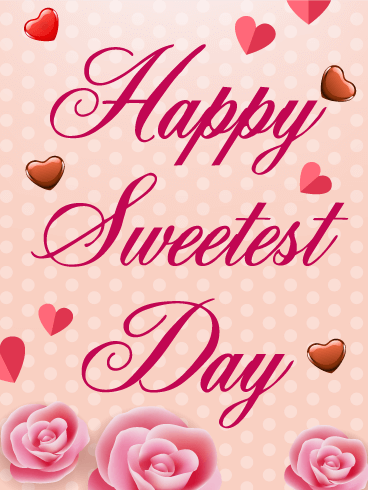 Make this Sweetest Day the best day ever by sending a touching message with this card today!